Discussion in 'General breed discussions & FAQ' started by toetoe, Aug 8, 2009. I have 2 birds I don't know what is their breed. I hope someone might be able to help me figure this out. The first one is a hen that was given to me. She is a pretty girl, she is 9 months old. We call her nugget. The second one is a 9 week old female, she was hatched by one of my hens. If anyone has any ideas of what breed they are that would be great. can you give me more details?color, legg color, comb type.. pics will be better...! I'd say it looks as if there's some Laced Wyandotte or Sebright in the first one (pattern residue and rose comb - reminds me somewhat of our SLW/Norwegian Jærhøne), and Silkie in the second. They both look like mutts to me, but what else might be in them I have no clue. Sweet ladies though! Not a silkie, but perhaps a silkie cross. 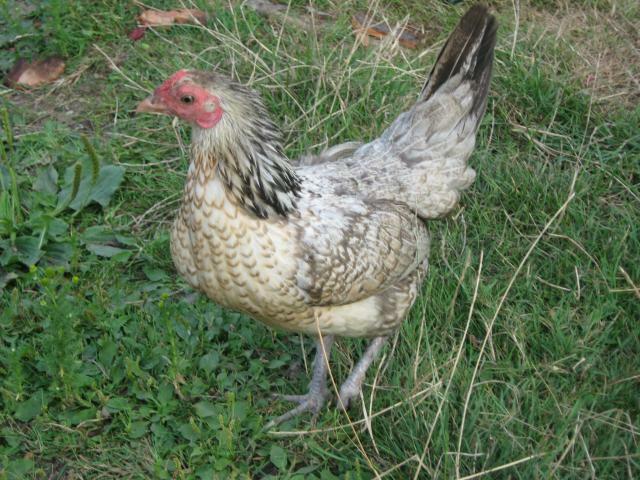 The first hen looks like an American game hen and she my be pure or could be a cross. She should be a great broody / mother. The 2nd hen looks like an ameraucana / maybe Cochin cross. When she lays I'd bet she lays blue-green eggs. Quote:The first one seems to have a Pea comb, not a Rose comb. Both birds look like EE's or EE mixes. Thank you very much for all your help. I now have some idea with what I am working with.